This past weekend I ran the last major encounter in my stint writing plot for NERO Hartford. It was essentially the final fight against the first end boss of the campaign. It was a relatively elaborate encounter, involving a split field (based on level), and four self marshaled tasks for the PCs set around the field which dramatically affected the dynamics of the battle. The battle lasted for over an hour of straight combat, and the villain was defeated….without one single hold being called! Now, I’m not going to say it went perfectly, but I did put a lot of preparation in to make sure it went as smoothly as possible. The players involved in tasks around the field were briefed before the encounter, and knew exactly what they had to do and what would happen (meaning no marshal standing over them). All OOG mechanics were reinforced in a notes section on the IG scrolls they were using to perform their tasks. An air-horn was used to signal the field effects making it unnecessary to call a hold to explain the change. The most important preparation happened just a few hours before the fight though. During a moment of downtime I had an opportunity to sit down with a good chunk of the players. My exact words to them were “If any of you call a Hold, there had better be a compound fracture involved”. While this is obviously hyperbole, they knew my expectation. I have little to no tolerance for superfluous holds. I personally think they should be limited to medical situations ONLY. It should become the goal of all staff and players to run a game with no holds (which also means trying to run a safer game with less injuries). Holds destroy immersion. You are wrenched right out of the game and brought back to the real world. Staff can do many things to avoid these situations. NERO in its first year always included a guy in an orange headband marked “MARSHAL” carrying a clipboard following the party and narrating huge chunks of the encounter. It was like playing half table top/half LARP. I have really grown to dislike this style of play. My friends and I ran a NERO sub campaign in the mid-90’s called Kyrandal. One of our major principles was to never include anything in the game that we couldn’t rep in a reasonably realistic way. We had really grown to hate the phrase “What do I see?”, and wanted to run a game where this was never heard. (Cue to an old Ravenholt event where a kid who wasn’t more than 5’6” came running through the trees as a “9 foot tall T-Rex”). I can’t stand hearing, “Hold, marshal, do I recognize this guy from the October event in blah, blah, blah?” or “Hold, marshal, I have 10 levels of Kobold Lore, do these look like Kobold droppings?” I have learned a great deal from Dan’s entries and the LARP Ohio blog how to create encounters with as little of an OOG component as possible, how to get in front of these problems and brief the party ahead of the encounter, or have envelopes prepared if an applicable skill would provide key information. One of my favorite ideas of Dan’s is to include a marshal who is in fact an IG confederate traveling with the party, and explaining OOG mechanics or answering questions in a IG way. I don’t want to digress too far into a discussion of what helps or hinders immersion, but the two topics do go hand in hand. Many of the principles which help create immersion, and remove the need for an OOG marshal, help prevent that most offensive of all four letter words, “HOLD”. One of my current quests is to learn more about the logic behind how NERO monsters are currently built. (I’m currently working on a monster build guide and a scaling guide which may facilitate a revision of the monster database.) I was interested to see some of the data about our monsters displayed visually. So I got a hold of the NERO National Monster database in excel format. Here are some charts I made to examine the relationships between level, body points, and weapon damage. As a bit of background: the National Monster Database is a set of 319 monster stat cards which are distributed to all chapters of NERO. Chapters don’t have to use these monster’s stats, but it’s encouraged that they do so that there’s continuity in the creatures you encounter all over the country. During the game, the stats are often tweaked and tailored (this is called “scaling”) to adjust for players they’ll be facing – as well as other concerns of the LARP weekend. 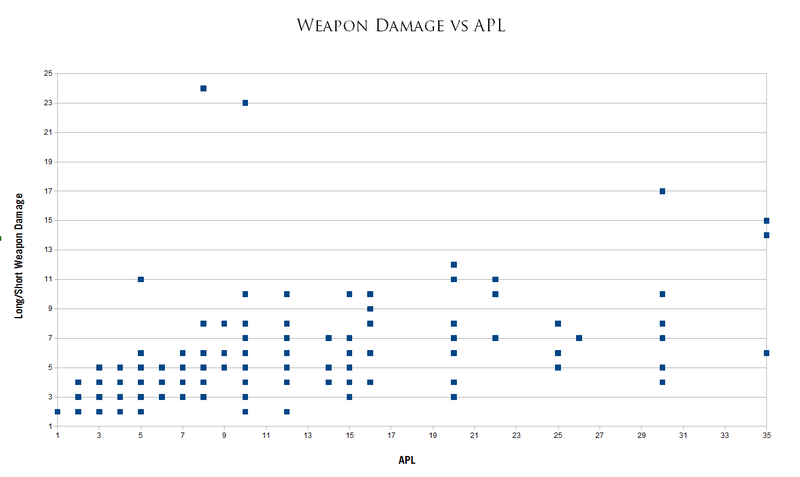 So let’s take a look at some of the most important data: hit points, damage, and APL. All monster cards have an APL, or “approximate player level”. This is theoretically supposed to tell us which experience level players this monster is a good match against. When these monsters were created, there was probably some formula to calculate the monster’s APL, but I suspect this equation is lost to the mists of time. APL is a good method of ballparking a monster’s power, but shouldn’t be interpreted too literally. 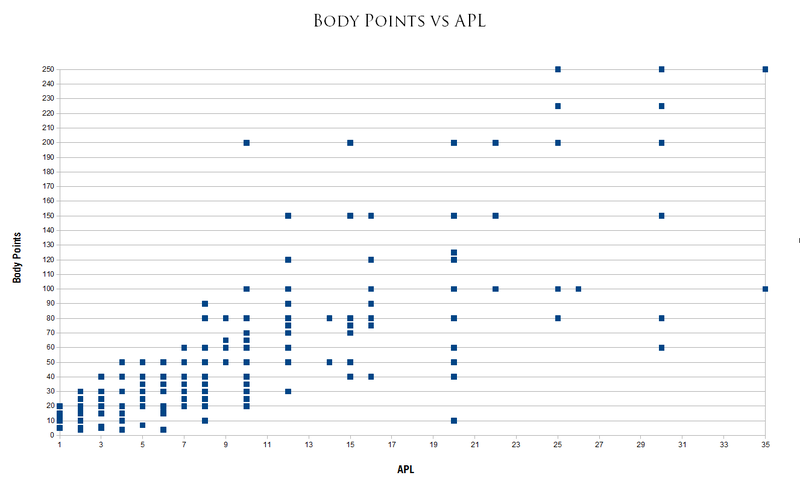 This first chart displays the relationship between body points and approximate player level. The majority of the content in the database is designed to fight characters of level 15 and under. Past level 15, there is less fine differentiation between levels of monster power. Monsters are clustered around APL 15, 20, 25, 30, 35. The second chart displays the relationship between approximate player level and long/short weapon damage. This may be a bit misleading because many monster’s weapon attacks are dangerous because of their carrier attack, not their damage number. And monsters with two handed weapons often have much higher damage than long/short weapon users due to the monster’s strength bonus. That being said, we can still get a rough idea of how monster’s damage input is related to their approximate player level. Before level 15, most monsters swing 5s to 10s. Not many monsters swing 20s before adding PC skills and other buffs. So if you’re fighting a creature that swings 20s, it’s probably been scaled up. 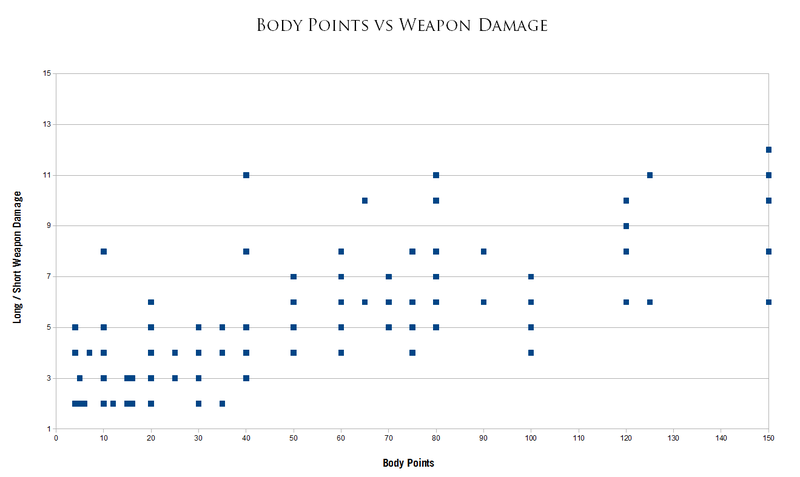 Here’s the relationship between weapon damage and body points. I thought this might be useful because in my experience, directors tend to scale based on body points rather than player level anyway. Level is a rather abstract way of evaluating a monster’s power – body points and weapon damage are generally a more reliable measure of what it’ll be capable of and how long it will last. The rule of thumb I’ve seen in many NPC camps is to stat monsters with about 1 weapon damage per 10 body. For example, you tend to see monsters with 40 body swinging 4s, 50 body swinging 5s, 60 body swinging 6s, et cetera. This usually gets tweaked after adding abilities and other scaling factors, but that’s the template. On this chart we can see that this is more or less in line with the monster database up until monsters have over 80 body. It’s rare for a basic monster to swing over 10s. Keep in mind that these numbers do not account for armor, carrier attacks, threshold, magic, player character levels, and other abilities which many monsters possess. But as a very rough thumbnail of the monster database, I thought this was very interesting. Did you learn anything about our monsters from these data? Let us know in the comments. One of my ongoing quests has been to help make the Tyrran setting more coherent and tangible. NERO’s main advantage over other games is that we have a gigantic collaborative fantasy setting with over 40 dramatic locations in the world that you can visit. But in reality, it doesn’t feel like we’re all playing in the same world, does it? You play in one or more chapters in your region, and the rest of the world is kind of irrelevant. Think about it: are you worried about undead taking over the chapter on the other side of the country? You don’t care — it has no impact on the game you play. You rarely hear news from chapters outside your region. One of the ways that I want to combat this is to establish a real setting guide. I want to capture all the information about our setting in one place so you can see how your chapter fits into the world context. In 2006, I wrote a manuscript for the Guide to Tyrra, a big book about the Tyrran setting. Part of the goal was to compile and index the hundreds of pages of history, race packets, and other documents hosted on nerolarp.com. I also wanted to document the setting as it exists now and chronicle recent Tyrran history. A lot of drama and real-life chaos has happened in the interim, but the book is slowly inching towards publication. (quick side note: biggest factor delaying this publication? lack of budget) I gotta tell you – it was really challenging to write! In part because it’s hard to find all that info and put it in context, and in part because of a weird philosophical problem: When we’re talking about an imaginary world, what makes something true? The source documents for our setting contain numerous contradictions. Whenever you declare something as true, you end up alienating the people who believe it is false. For example, does anybody know anything about the NPC Kingdom Dar Khabad? Is it one of the “three sister kingdoms” or has it joined the kingdom of Evendarr? Is it ruled by mages? mercenaries? A king? Even basic information about Dar Khabad varies dramatically by where you’re playing. Originally, I had intended on including a lot of chapter-specific information in the Guide to Tyrra. I wanted to have two to five encyclopedia-style pages about each chapter. That would really bring the setting to life, wouldn’t it? This proved to be a very daunting task. Some people were amazingly helpful, others went out of their way to be counterproductive. Seriously, people actually worked to make sure I’d fail at this task even though I was basically trying to publish a commercial for their game. There’s also this catch 22 that some people want me to prove that I’m trustworthy before they participate, thereby hamstringing cooperative projects and ensuring their failure. Long story short, the Guide is now focused on general setting info, including material on races and world history, but does not include much geography or chapter specific setting info. One of the things I realized is that there are more efficient ways of capturing that chapter-level creative output than relying on a single contact point to index all of it. Luckily for us, technology exists for exactly this purpose: The Wiki. There used to be a NERO setting wiki called Tyrrapedia. It eventually shut down for a variety of reasons, but it did succeed as a proof of concept of how this medium could be utilized. I am creating a NERO setting wiki, another Tyrrapedia, and I want to go about it in a slightly different way. You won’t be posting as your character, you’ll be posting as a scholar who is studying the region you’re writing about. That scholar has visited the region, and he knows most of the stuff that you know out-of-game — except secrets and information you should really find out when you’re actually playing the LARP. Why not just post as our characters? Lots of reasons. My character has an agenda and he is biased in certain ways which counter the goal of an information wiki. And by making Tyrrapedia a theater for politics and personal character goals, we would be setting the stage for edit wars. That strikes me as incredibly lame… an edit war is something that exists squarely in the 21st century – if I engage in one, what exactly is my character doing? When I tell people about this, do I say I traveled thousands of miles to a scholarly institute where I spent a few hours crossing out information that other people had written and plugging in my own notes? It’s a stretch. The scholars who are writing the Guide are NPCs. Therefore we shouldn’t have to worry too much about player-characters who will be disruptive, wikiturf, editorialize, or portray events in a personally favorable way. And if they do, we can always moderate it. I want Tyrrapedia (and the setting it describes) to be a true product of the NERO community. Chapter staff members will be able to moderate their own pages and make sure that their setting is presented how they’d like. We’ll also be open to players writing about the setting and filling in all those little details which make it come to life. Part of this will involve coming up with policies which will settle the inevitable disputes. Here’s an example of the types of inconsistencies that will occur: a few weeks ago at Ravenholt, I was walking around my manuscript for the Guide to Tyrra. I showed it to Jade Marston, a veteran NERO player who wrote the bulk of the NERO Sarr Race Packet. I thought she’d be thrilled because the section in the Guide on Sarr is very closely based on the published race packet. But she was actually quite frustrated. She said that when she wrote the packet, she decided that Sarr have the same lifespan as a human. But at some point, somebody who was editing the packet decided that each clan of Sarr has a different life span. Some clans have long lives, others only live to age 10. I’m not sure who made this change. My best guess is that the original race packet was modified to jive with information that had been established somewhere else in the country. Jade was really frustrated by this – she’s been playing her NERO character for longer than many Sarr’s lifespan. She feels responsible for this data and asked me to change it to the “correct” lifespan. This is the really frustrating thing about standardizing conflicting information. If I were to modify this piece of information to match Jade’s intent, it will alienate the hundreds of NERO players who have Sarr characters and have been roleplaying a short lifespan. But if I don’t change it, I’ll have stepped on the toes of an author who cares greatly about that information. There’s really no way to satisfy everybody, so the best I can do is to satisfy the most people. This is par for the course when collaborating with this many people – no concept survives untouched. And this is why wiki is the perfect format to collect information on a collaborative setting. If there’s incorrect information on the wiki, you can correct it yourself. If the community is working together on the setting, we can establish consensus and work towards a coherent description. Assuming everything goes fine on the technical end, the new incarnation of Tyrrapedia should be launched in the next few weeks. We will be accepting applications for moderators. I would like to get as many NERO members involves as possible — so long as they are interested in cooperating and can roll with the daunting challenges of this project. And in the end, if we succeed, we will have made our giant 40+ chapter setting much more tangible and accessible. It will feel like you’re playing in one corner of a large fascinating world ripe for exploration. We will have captured a lot of data which currently exists only as an oral tradition. And we will be standing atop the largest and richest setting guide of any existing LARP. “Is this going to be fun?” is the most important litmus test for anything you run at a LARP. Your plot, encounter, or NPC may be pretty epic and cool in your head, but it’s possible that you are ignoring how players will experience it. Keep in mind that players come to the game with a spectrum of motivations. Some love story, some love overcoming challenges, some love treasure, some just love being in their character’s headspace. As such, your content needs to include rewards for numerous play styles. For example, you may be writing an encounter in which the players finally meet the NPC they’ve been looking for, and he imparts a wealth of knowledge onto them. In the script, you’ve blocked out two hours for roleplay with this NPC. In practice, a few of the players will want to interact with the NPC, and the rest will probably hang out and wait for something more their speed. Is this two hour long dialogue going to be any fun for them? But if wandering monsters attack the area while the dialogue is going on, you’ve introduced a tactical element to the encounter which will entertain those seeking more visceral rewards. If your encounter isn’t fun, it doesn’t matter that your plot is engaging, the monsters are well costumed, or that the rewards are glorious. The players will react with boredom or frustration. Too much of any one thing is not fun. A weekend packed with mindless battles can be as boring as a weekend with no battles at all. Being kidnapped, stricken by disease, or trapped somewhere can rapidly become monotonous. If your script includes the words “the players do X for Y hours”, go back to the drawing board. LARP is both a form of gaming and theater. As such, it’s about experiencing something (as opposed to hearing a narration about it). Focus your efforts on making the players’ experience as fun, memorable, and interesting as possible. The best way to do this is to hold each plotline under a magnifying glass to see how fun its parts are. You are currently browsing the archives for the Behind the Scenes category.